Greta Funk is a mother of four who runs multiple 5K races each year and stays busy chasing her brood across the plains of Kansas. To look at this busy mama, all feisty 5 foot 3 of her, you’d never know that at one time, she weighed just shy of 200 pounds. Through portion control, food tracking and consistent cardio workouts, Greta has managed to shed 51 pounds and keep it off. Through high school, Greta remembers being thin but said she noticed the pounds start to creep on when she started college. 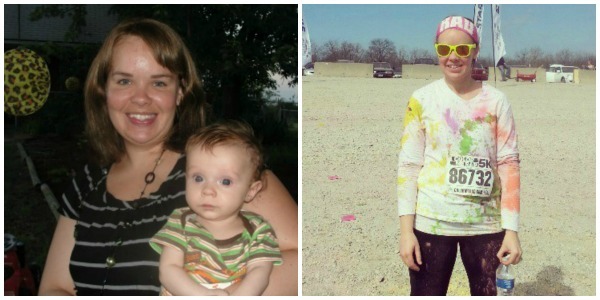 She gained the classic Freshman 15 and then once she started having babies, the pounds refused to budge. Poor eating habits added to the weight gain. “I was terrible about watching portion sizes or stopping when my brain was full,” she said. Although Greta often worked out off and on over the years, she realized she would have to adopt a different mindset and make her commitment to exercise more consistent. To fight the doldrums, she mixes up her routine using her home treadmill to run (and get ready for all those 5K races) but says she also likes the Turbo Fire DVD’s (intense cardio workout) and fitness challenges offered through Mamavation. Mamavation is a social media group that encourages support and interaction for healthy living and weight loss but does not endorse any one specific diet or exercise routine. Greta may love her 5K races but with her determination, it wouldn’t surprise me to see her run a marathon some day. Great job, Greta!